Hello! 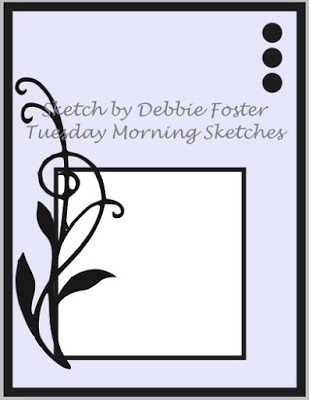 I was playing with a new stamp from Gina K's Skeleton Leaves and created a couple of Clean and Simple cards. For the top one, I stamped the Leaf and Sentiment with Versamark ink and heat embossed with Copper EP. 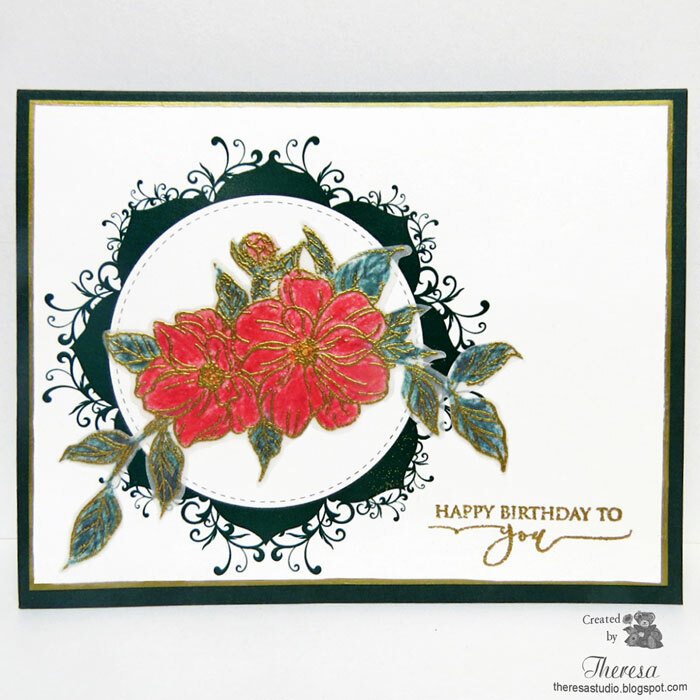 I placed on a mat of Black CS and used a Card base of Copper Metallic CS. Finished with some black sequins. For the second card, I stamped the leaf 3 times with Memento Tangelo ink inspired by the sketch at CASE this Sketch. I stamped the same sentiment with Versamark ink and heat embossed with Copper EP. 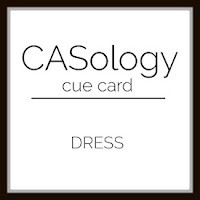 Simply attached to an Orange Card Base. Hello! 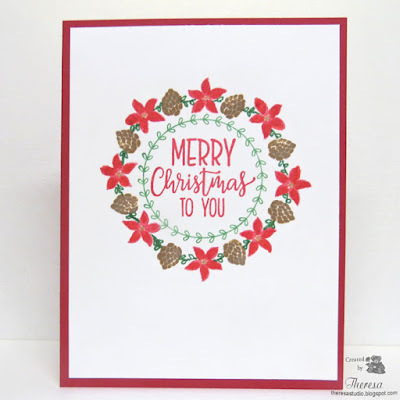 Switching seasons today...thinking ahead to winter holidays making this Christmas card using Gina K Snowflake Stamps from Seasonal Sentiments set and the GKD Sentiment from Holiday Wreath Builder. 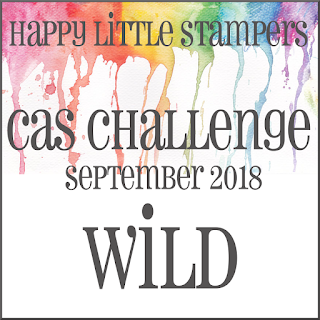 I was inspired to make this design after watching Gina K's September Release Video and her challenge Emerging Images-use the Emboss Resist technique with your favorite stamps to make your images emerge from cardstock. I stamped the Snowflakes with Versamark ink and heat embossed with White EP. I then used Memento Summer Sky to bring out the images. I stamped the words with Memento Blue Danube and added some rhinestones . Inked the edges with Pilot Silver Metallic Pen and attached to GKD Powder Blue CS. 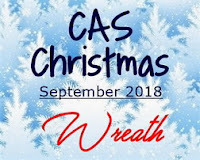 Craftyhazelnut's Christmas Challenge: 405 Anything Christmas with optional theme use something beginning with the letter S. I used Snowflakes. Hello! 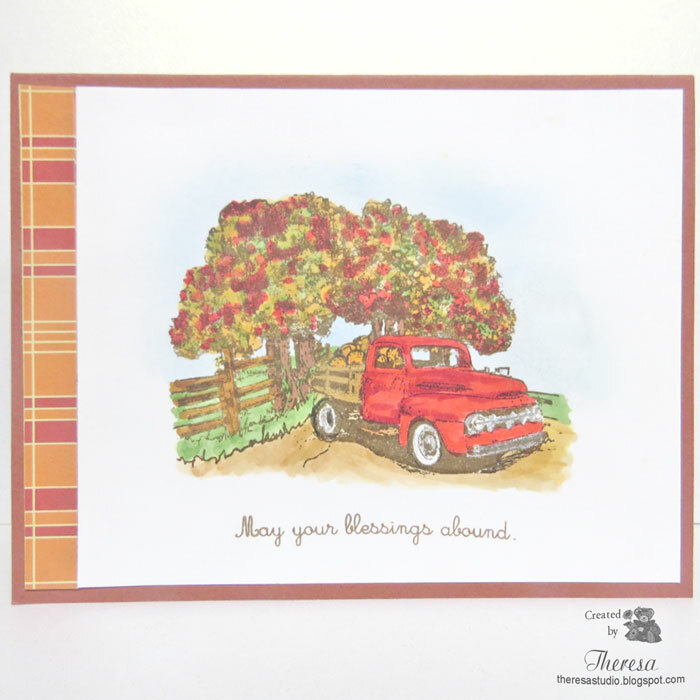 You might recognize the truck on my card.....I used it on another card here earlier. 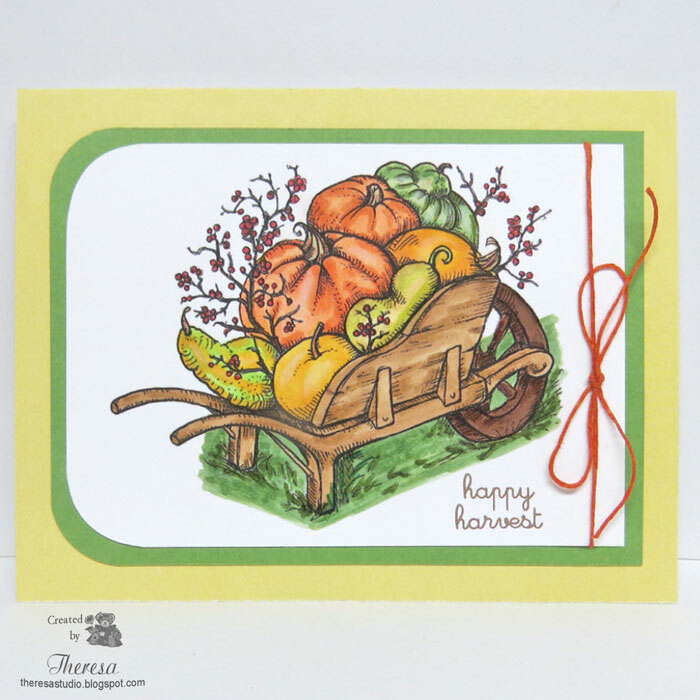 Since I had this old stamp out, I thought I'd use the entire image on a fall card. I inked it with Memento Rich Cocoa ink on a white CS and colored with Copics this time. Sponged the sky with Memento Summer Sky ink. Stamped the Power Poppy sentiment with the brown ink. Finished with a striped patterned paper remnant laying on my desk and a coordinating card base. Welcome! Still thinking of fall leaves and pumpkins. 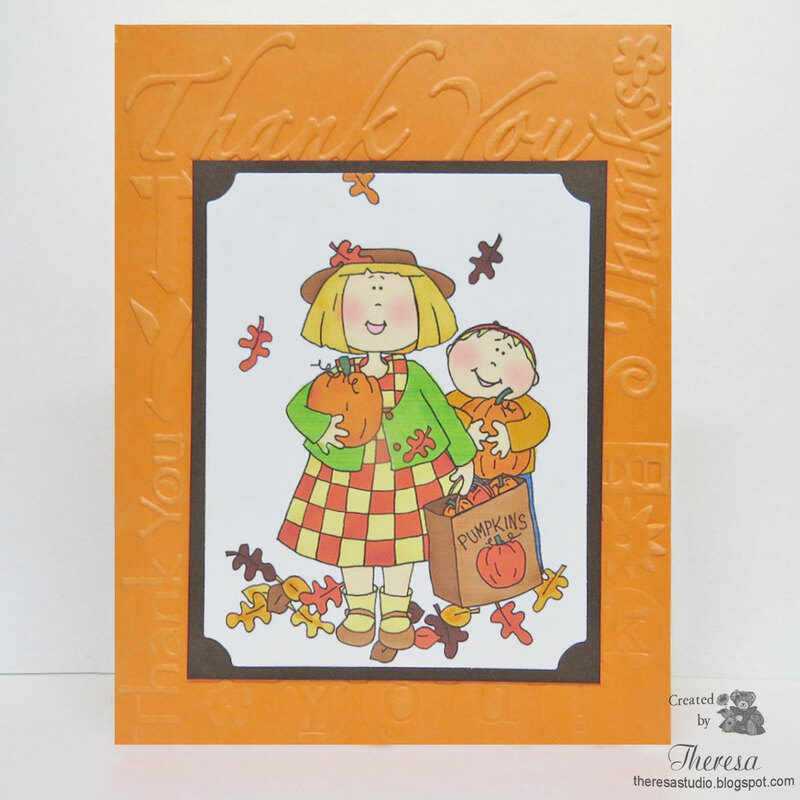 I came across this cute Dearie Dolls digital image in my files and decided to print out and put on a thank you card. I added some coloring to the already colored version and trimmed with a die and placed on a brown mat and then an embossed orange card base. Used a Sizzix EF Thanks. Die Cuttin Divas: Challenge #388 Fall Colors. 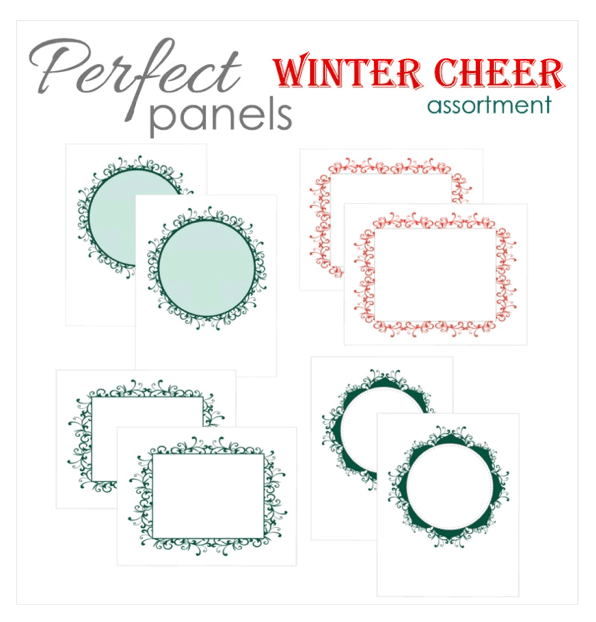 Use Spellbinder Nestabilities Rectangle and Label dies. Welcome to my studio! 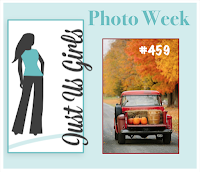 I was inspired to create this card by the Photo Challenge Week #459 at Just Us Girls. I loved the fall trees, colors and the old truck in the photo. I knew I had an old truck stamp but it took me a while to find it. 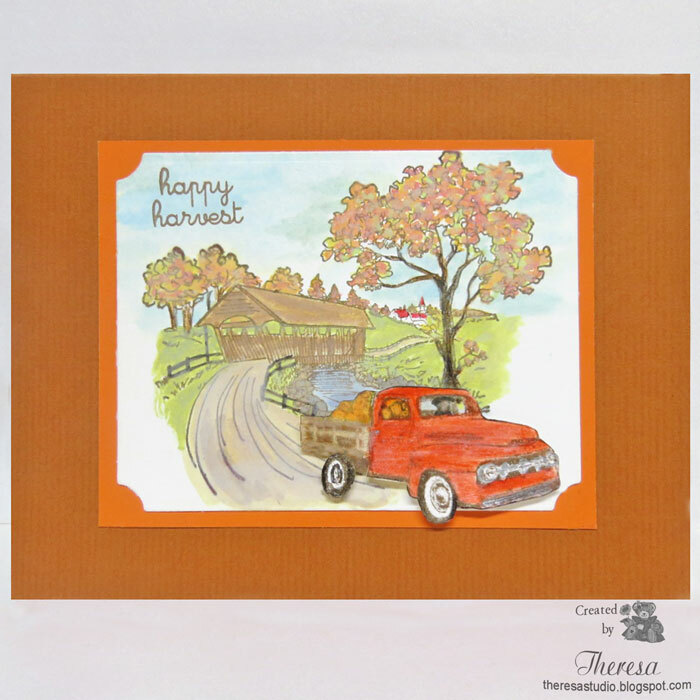 I had created the fall scene before I remembered where it was so I had to invent a way of including the truck. But back to the beginning, I stamped a Repeat Impression stamp Covered Bridge with Memento Rich Cocoa ink on heavyweight white card stock and colored with an number of Distress Oxide Inks....actually used a dozen of them but too lazy to list. Also used some pencils in some areas. I might should have used watercolor paper but I was happy with the results on this paper. 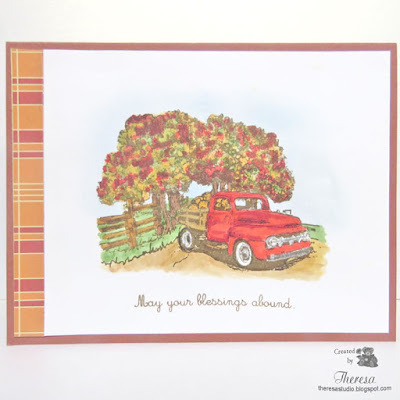 By the time I finished this scene, I found the old truck stamp in my Mark's Finest Paper stamps. 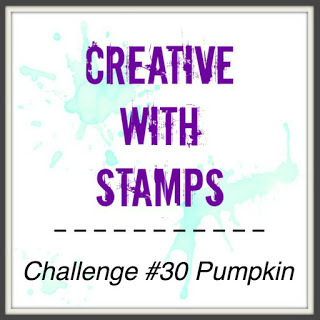 I stamped it in the same ink and colored with Distress Oxide Inks and some pencils. I drew some pumpkins in the back of the red truck and added a driver into the cab. I fussy cut the truck and attached it with foam tape as if he is driving down the dirt road and off the edge of the scene. To finish, I added an orange mat and a textured rust color card base. Stamped a Power Poppy sentiment Happy Harvest since there was an abundant harvest of pumpkins in the truck. Had fun combing the stamps to create this scene. 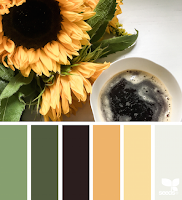 Make My Monday Challenge:#80 Autumn/Fall Colors. Third entry. Hello! 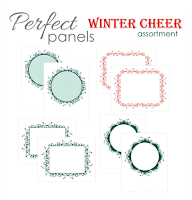 My card today began with a preprinted Perfect Panel from GKD (prize that I won some time ago) which is shown below in the complete assortment. 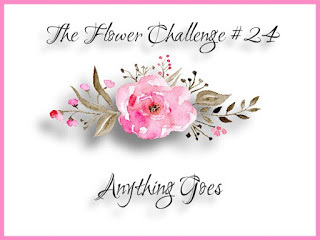 I stamped a Floral image from Gina K Whimsical Wildflowers bundle set on Clear Vellum with Versamark ink and heat embossed with Gold EP. I colored the back of the image with Pencils and cut with a die from the GKD die set. I attached the cut out with Vellum tape to the green circle printed on the panel that I used. I stamped a sentiment from the same set with Versamark ink and heat embossed with the Gold Metallic EP. Edged the white panel with a Pilot Metallic Gold Marker before attaching to Christmas Pine card stock base. 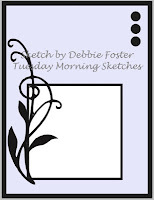 I used the Sketch #472 from Tuesday Morning Sketches as inspiration for my design. Tuesday Throwdown: #411 Use Complimentary Colors. Used red and green. Welcome to my studio! Today I was experimenting with stamping and coloring on a dark background using Black CS...nothing darker than that. I stamped Power Poppy Poppies and Sentiment with Versamark and heat embossed with Hero Arts Silver EP. 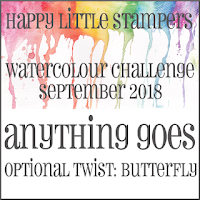 I used DOI Candied Apple and Lucky Clover to color the image using a water brush to apply the ink twice, drying between applications. First time to try using DOI on such a dark paper. Of course the colors are quite muted on the black papers but I like the outcome. 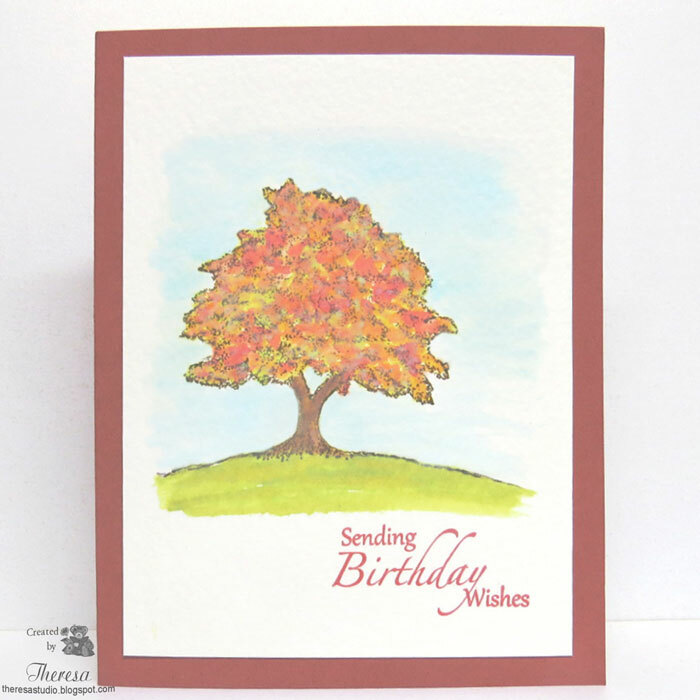 I used a Blue-Green CS as the card base which matches the color as it appears on the leaves. 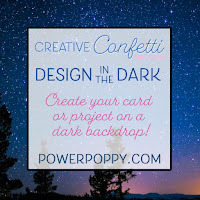 I am entering this card in Creative Confetti Challenge Design in the Dark at the Power Poppy blog. Hello! 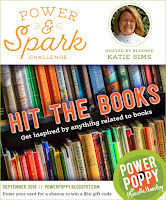 Today I am playing with the Power & Spark Challenge -Hit the Books. We are to be inspired by anything related to books. I combined a Power Poppy digital image Sunshine of My Life with a Bee Crafty digital of a stack of books that I resized and printed on White CS. I colored with Copics and combined with some scraps of some striped paper that went well with the colors that I had used. 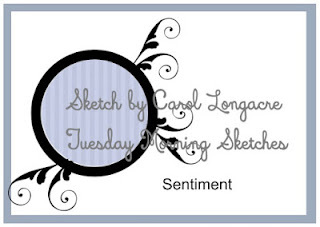 The stamped sentiment is from a Jane's Doodles set. When I showed this card to my DH, he suggested that I add some titles to the books which I did with a Micro Uni-ball pen. Have a great day! Take time out to read a book. Hello! 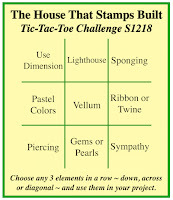 Playing with some old stamps that I pulled out for the challenge at Double D Challenges-If the Shoe Fits. 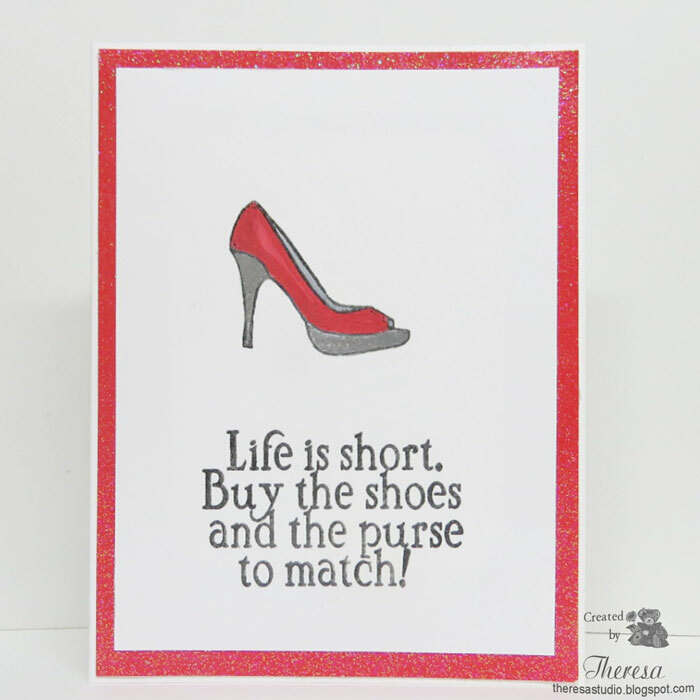 I made a CAS card stamping the shoe and sentiment from Mark's Finest Papers with Black ink. Colored the shoe with Red Copics and heat embossed the heel and sole with Silver EP. Looks much better in real life than in the photo. Used a Red Glitter CS for Mat and White card base. Fall is in the air! Enjoying the cooler temperatures and change of seasons. 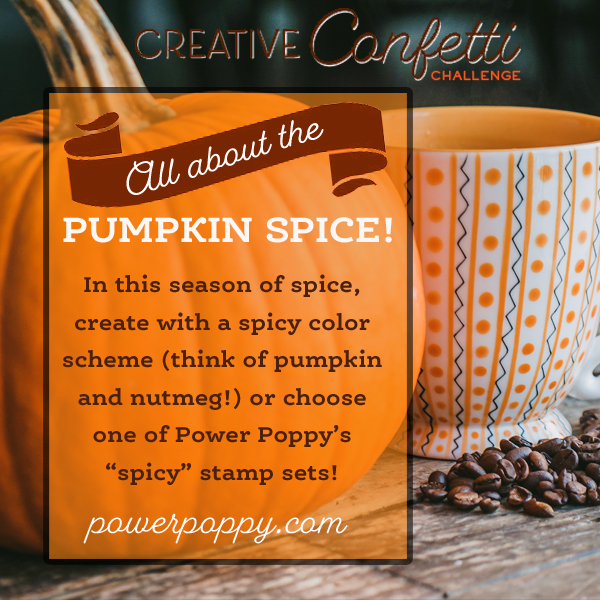 I printed out a Power Poppy digital image Fall Haul loaded with pumpkins that I colored with Copics. 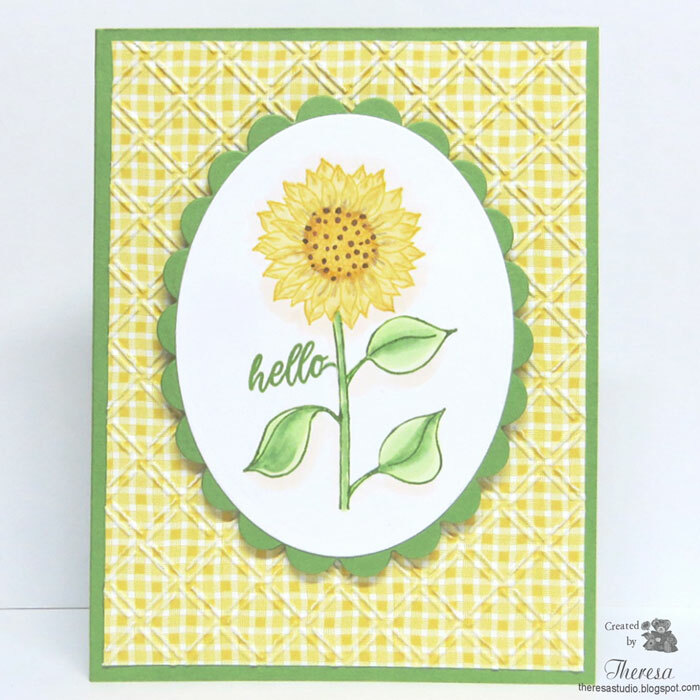 Created a simple card using a Grass Green Mat and card base of Yellow CS. Finished with a sentiment stamped with brown ink and an orange twine. This card is loaded with pumpkins so I think it will fit into Creative Confetti Challenge All about the Pumpkin Spice. 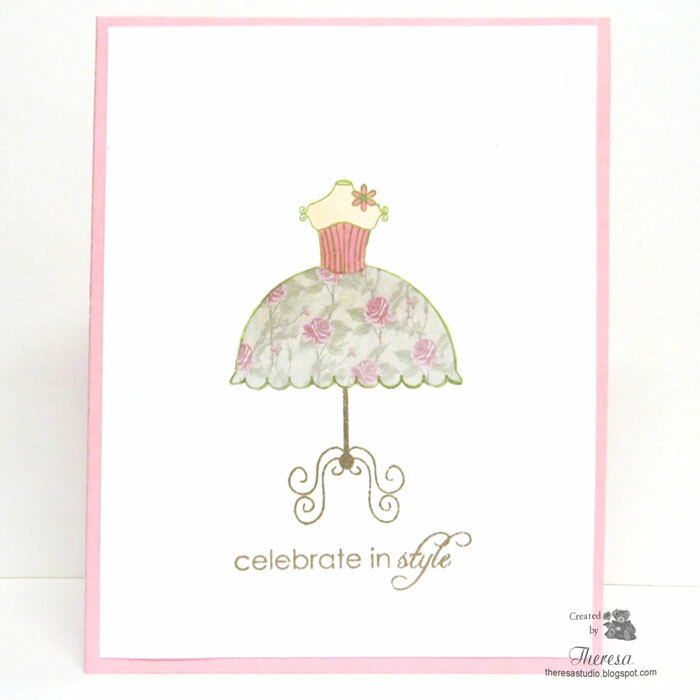 Daily Bread Designs Shabby Rose collection and then a card base of Metallic Gold CS. Sentiment from Gina K was heat embossed with Gold EP. 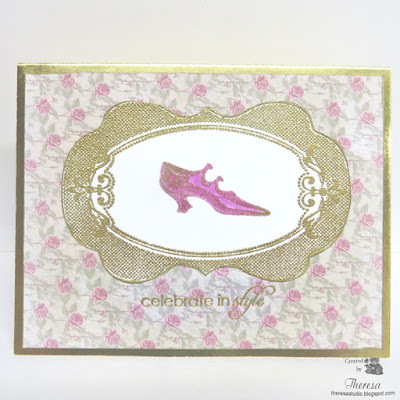 The second fashion inspired card features a Gina K stamp from Celebrate in Style set. I stamped the dress with DOI Peeled Paint, colored with copics, and paper pieced the skirt with a scrap leftover from the card above. The base of the dress form and the sentiment were heat embossed with Gold EP. Hello! Today I am sharing a card that I made for the Inspiration Palette Challenge S1918 at The House That Stamps Built using Repeat Impressions Sunflower stamp. I stamped the sunflower on White CS with Memento inks and colored with Copics. I stamped the Hello using a Gina K stamp. I cut the image with Nesties Oval die and placed it on a Green Scallop Oval cut with another Nesties die. This was attached to an embossed pattern paper from Graphic 45 and then a card base of Grass Green CS. Craftyhazelnut's Patterned Paper Challenge: September anything goes using patterned paper. Welcome! 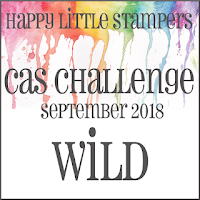 Today I have a CAS card featuring Wild Flowers stamped with Happy Little Stampers Doodled Flowers set. 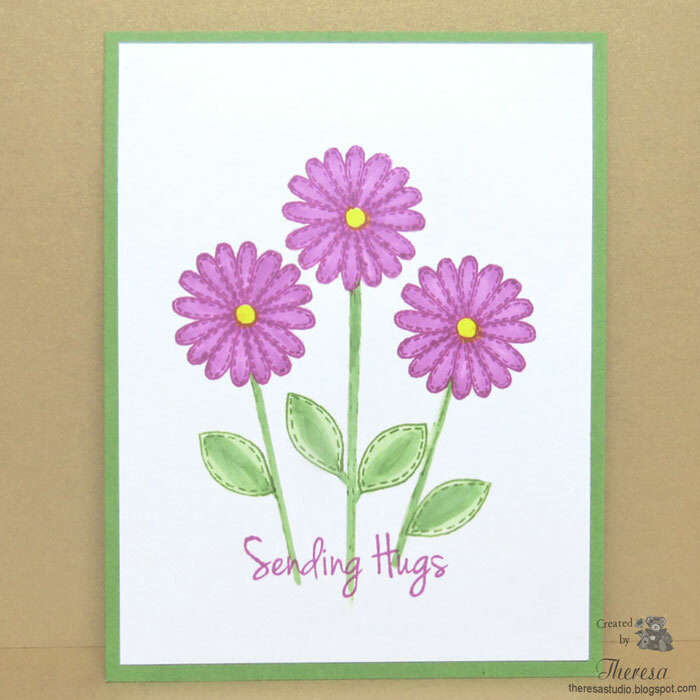 I inked the stamps with Memento Lilac Posies and Bamboo Leaves inks and stamped on white cardstock and colored with markers. Attached to a Grass Green CS. Quick and easy. Hello! Don't you just love "Pumpkin Season"....could be another name for Fall? And I love using pumpkins on cards....maybe it's the bright color that gets me. 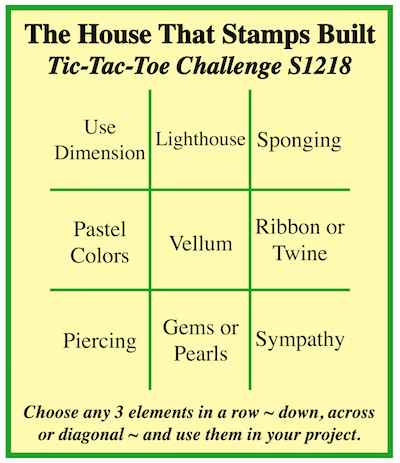 I just had to make this card following the current sketch from Tuesday Morning Sketches...just called out for a pumpkin in that square element. And that photo inspiration from Time Out challenges said to add some orange roses. 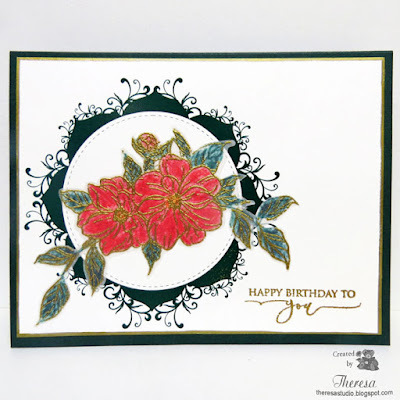 The layering rose stamps from Gina K's Old Country Roses were perfect for that and I popped them up with foam tape. Used Gina K Ivory and Grass Green CS's with a pattern paper from a Fancy Pants Designs pad. 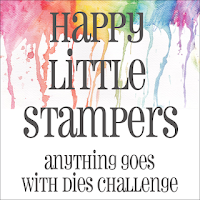 Used Cheery Lynn Large Flourish die (rearranged) and Nesties square dies. 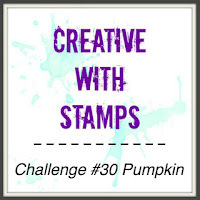 Pumpkin stamp from Repeat Impressions. 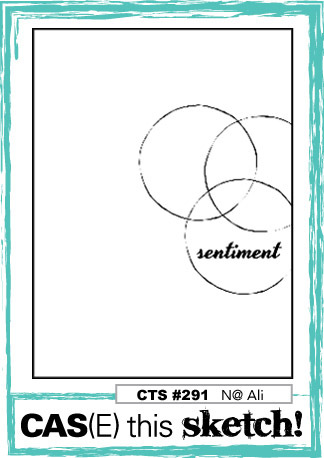 Sentiment stamp from a Gina K set. Used Memento inks for stamping and Copics for coloring. Finished with some bling of Orange Dew Drops. 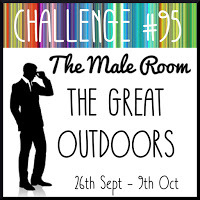 TIME OUT Challenges: #118 Home Sweet Home Photo Inspiration. 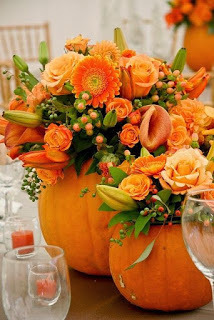 Love the pumpkins filled with orange flowers. 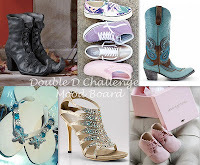 Simon Wednesday Challenge: Simon Says Bling It On. Hello! Another Christmas card for my stash. I made this with Gina K stamps from the new Holiday Wreath Builder. I made a rustic wreath design using small poinsettia and pine cone stamps and Memento inks. A hand drawn design connected the images. Added the green circle around the sentiment in the center. 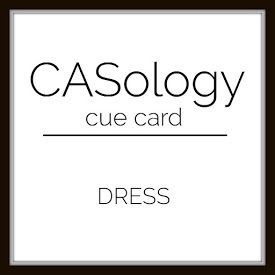 Finished with a Red Velvet card base to complete this CAS design. Thanks for stopping by. I enjoy your comments. Hello! First day of fall tomorrow! My fall card is another water colored design featuring a tree stamp from GKD The Northwood set. 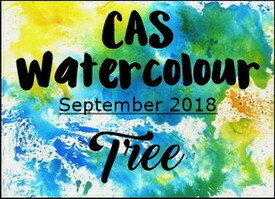 I stamped the tree with Memento Rich Cocoa ink on water color paper and colored with a waterbrush using DOI Walnut Stain, Fossilized Amber, Spiced Marmalade, Wild Honey, Fired Brick, and Twisted Citron to create a Fall Image. The sky was colored with Salty Ocean and the grass with Peeled Paint. The GKD sentiment was stamped with Fired Brick. Attached the image to a card base of GKD Tomato Soup CS. Welcome! Today I have been water coloring with Distress Oxide Inks....so much fun as I never know what will turn out. I began by stamping a butterfly from Gina K's Take Flight set with GKD Amalgam Black ink on watercolor paper and embossing with Clear EP. I then water colored the image with a water brush using DOI Fossilized Amber, Wild Honey, Spiced Marmalade, and Peacock Feathers. I created the water colored background with Faded Jeans and Broken China using a brush and water. I like the effect that I achieved. I added a mat of GKD Little Boy Blue CS and a card base of Ivory. 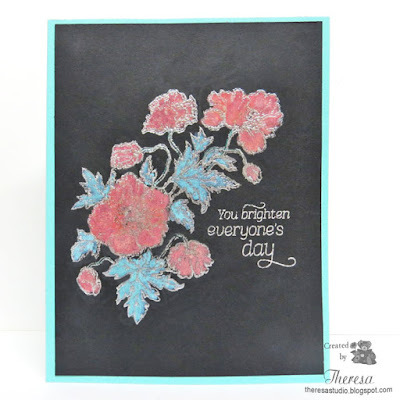 Stamped the sentiment from the same GKD set with Black Versafine ink. 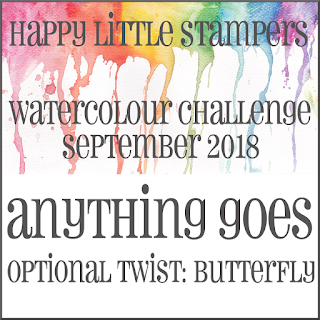 Stampin' Sensations: September Challenge I spy with my little eye something beginning with "B". I spy Butterfly and Blues. Hello! I was inspired by Challenge 16 at The Library Challenge to design this card featuring a digital image of a piano by Lauretta's design that I had in my digital files. 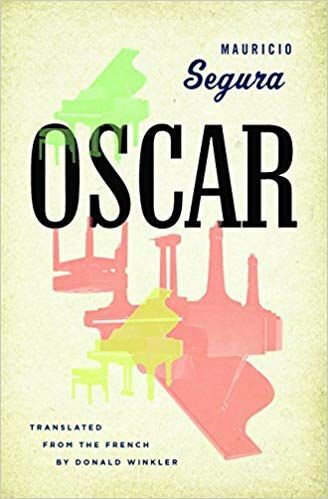 The challenge is the book Oscar by Mauricio Segura about the life of legendary jazz pianist Oscar Peterson' - the 'maharajah of the keyboard' . 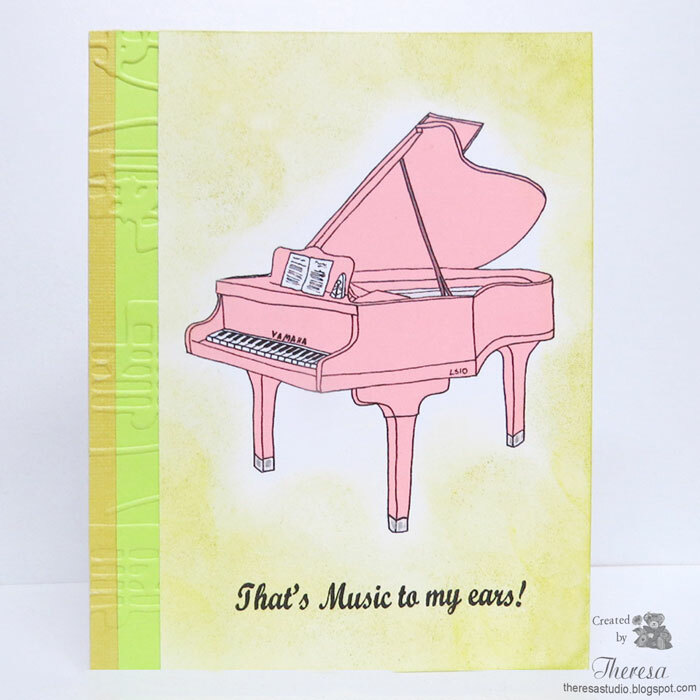 Therefore my card features the Piano printed on White CS that I colored pink and then sponged with DOI Peeled Paint to give a distressed look similar to the look on the cover. 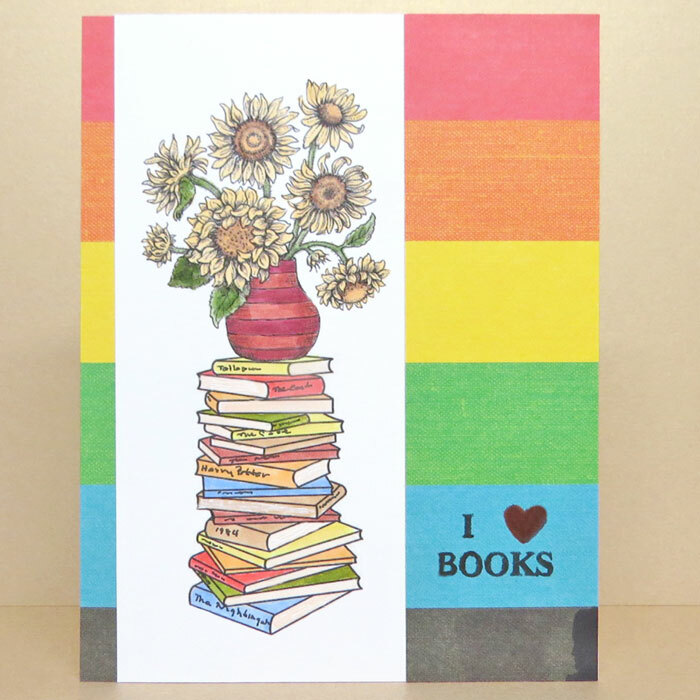 I added 2 strips of CS with some musical embossing picking up other colors on the book cover. 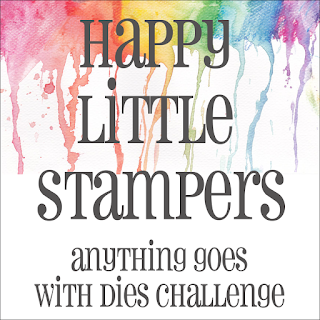 I stamped a sentiment from Mark's Finest Papers with Black ink that was appropriate for the card. 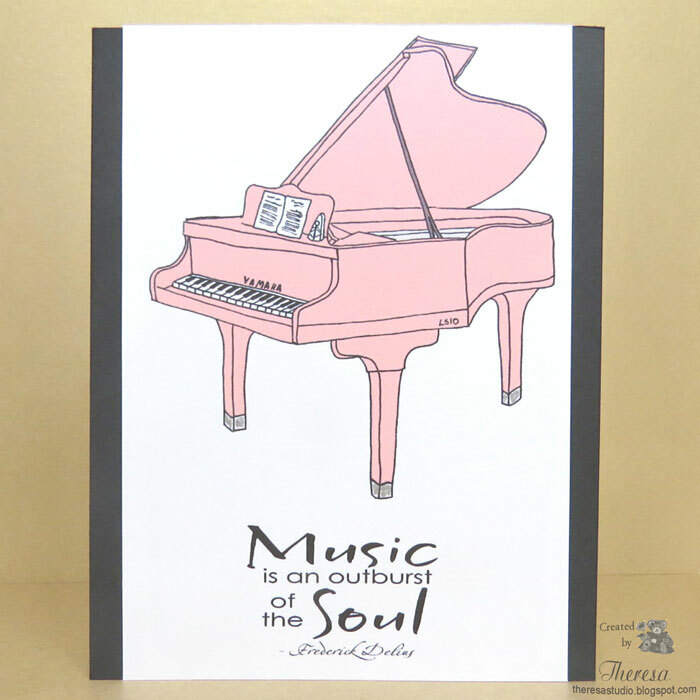 Since I had printed the piano twice, I decided to make another card using a white background with a pink piano on a card base of black CS. 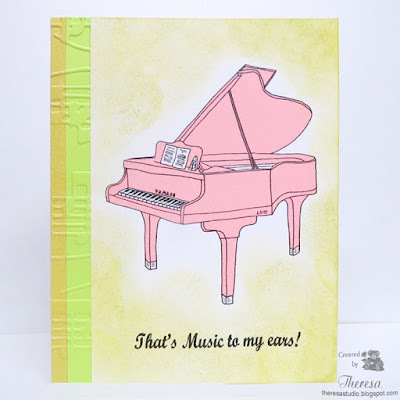 I added a sentiment from Raindrop Echo designs which seems to describe the music of Oscar Peterson. 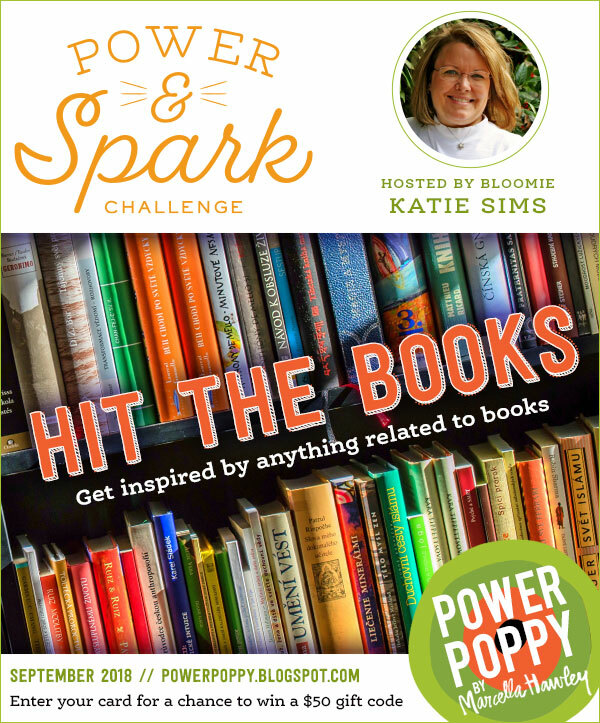 Power and Spark Challenge: Hitting the books. Get inspired by anything related to books. This card fits the challenge since I was inspired by the book Oscar. Sorry I did not use any Power Poppy stamps. Hello! Sharing another Lighthouse card. 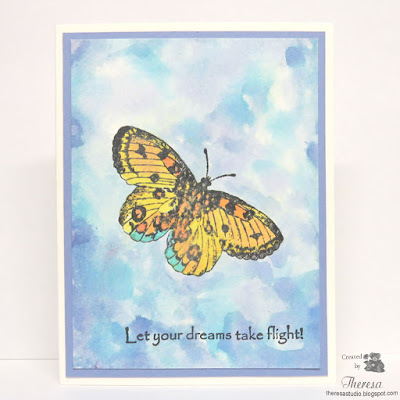 This one features a stamp from Art Impressions that I stamped twice with Memento Tuxedo Black ink and colored with Copics. I sponged the sky with Memento Summer Sky and the grass with Bamboo Leaves and added some "M" birds with a black marker. Also embossed some clouds. I fussy cut one of the lighthouses and popped it up with foam tape. I trimmed the image with a Spellbinders die and placed on a background of Blue Patterned Paper from Kaisercraft that I embossed with Swiss Dots EF. 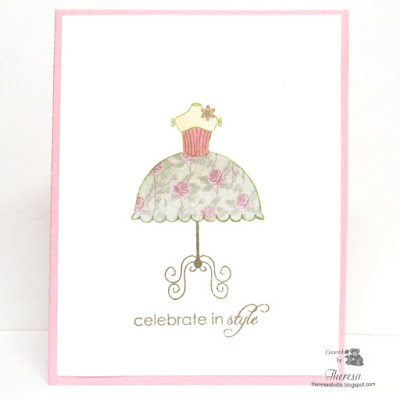 Finished with a White card base and a sentiment from Repeat Impressions. Also inspired by sketch shown below. 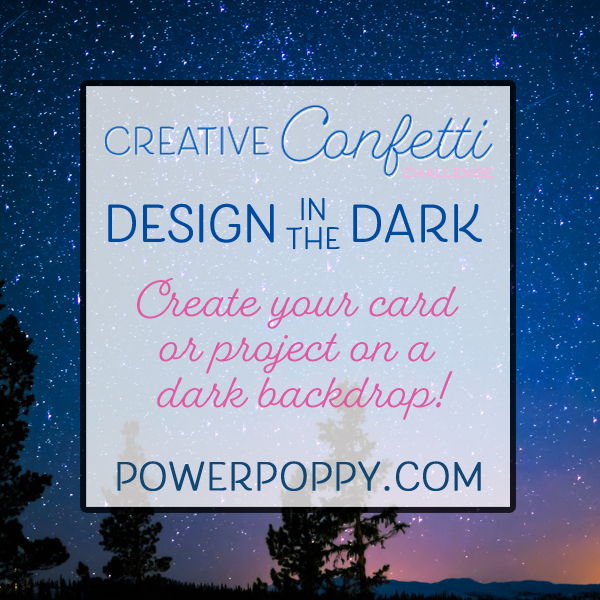 Daring Cardmakers: Who's the (Em)boss?! 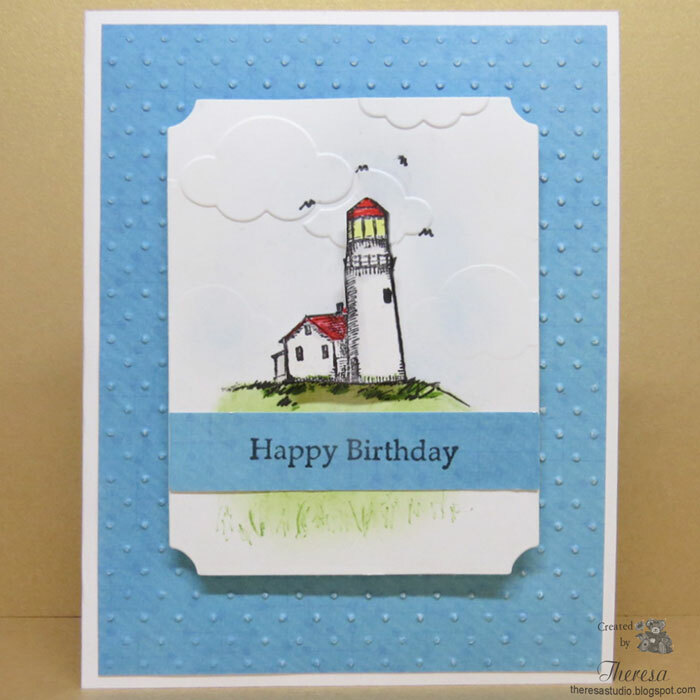 Used clouds and swiss dot embossing. 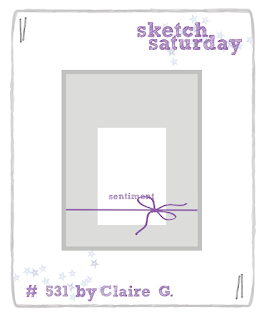 Sketch Saturday: #531 shown below. 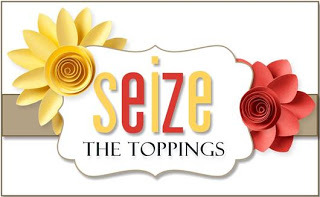 Seize the Birthday: Toppings Option is Die Cuts or Punches.